Standing as tall as humans and weighing up to 500 pounds, gorillas are the largest primate in the world. Gorillas assemble into complicated societies with females that have strong maternal instincts and males that are established leaders, known as the silver backs. Many researchers break down gorillas, which live in tropical forests in equatorial Africa, into two species--western gorillas and eastern gorillas--with four subspecies: western lowlands, cross rivers, eastern lowlands and mountains. Gorillas live in dense tropical rain forests, where they feed on the vegetation. The eastern gorillas eat leaves, stalks and shoots, but western gorillas tend to eat more fruit. Gorillas generally dislike bodies of water, but some that live in lowlands will wade into rivers to eat the aquatic plants. All groups of gorillas, known as troops, are nomadic and never stay in the same place for more than a day. Every morning, silver backs lead their troops to new areas where they will spend part of the day eating and foraging food for themselves and younger gorillas. They spend the afternoons napping, grooming and playing, before they eat again in the evening. They make nests out of leaves and branches to sleep in at night. 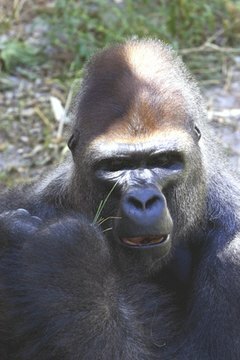 Western lowland gorillas live between Cameroon and the Congo River. The area encompasses Cameroon, Central African Republic, Republic of Congo, Democratic Republic of Congo--formerly Zaire--Equatorial Guinea, Gabon, Angola and Nigeria. Western lowland tends to eat more fruit than their cousins, meaning they find areas where their food of choice is abundant. They also live in smaller troops than other gorillas. Eastern lowland gorillas, the largest of the gorilla subspecies span east from the Congo River to the Democratic Republic of Congo’s borders with Rwanda and Uganda. They live in elevations less than 8,000 feet. Eastern lowlands, like their western lowland cousins, have short, soft, fine hair with no undercoat to better adapt to the warm, moist rainforest habitats. Mountain gorillas live in many of the same geographic areas as eastern lowlands, but they live in mountainous cloud forests, which reach as high as 11,000 feet. Mountain gorillas usually have longer hair to keep warm in the cooler, elevated habitat’s climate. Cross river gorillas have remote habitats, making them one of the most difficult to study, according to the World Wildlife Foundation. They live primarily in the mountains along the border of Nigeria and Cameroon. The closest subspecies of gorillas, western lowlands, are at least 155 miles away. Are Baboons in the Rainforest?